I suppose it stands as a relative measure of how big they were at the time. Whereas Engelbert had to make do with a single sleeve and a dozen tracks, Tom gets a twenty-track double album with grandiose “Tenth Anniversary” subtitle and lavish gatefold sleeve picturing the Welshman with his many celebrity pals, and a motley lot they are too – after the expected Sinatra and Elvis, there are Joni Mitchell, Ray Charles, Wilson Pickett, Smokey Robinson, Little Richard, Charles Aznavour, Tony B and Sammy DJ, but also snapshots (presumably all taken from the This Is Tom Jones TV series) of the man with Bob Hope, Matt Monro, Harry Secombe and Victor Borge; a conflict between aesthetic aspiration and the demands of light entertainment which I think penetrates to the very core of Jones’ music. Like the Humperdinck collection (and inevitably there’s a shot of Engelbert and a bearded Tom, grinning and resembling no one as much as Godley and Crème) the track selection is slightly random; just as bona fide hits such as “I’m A Better Man” and “Too Beautiful To Last” are absent from His Greatest Hits, so were only fifteen of Jones’ twenty tracks actually “hits”; conspicuous by their absence are the likes of “Detroit City,” “A Minute Of Your Time,” “Without Love (There Is Nothing),” “I (Who Have Nothing)” and the dreaded “The Young New Mexican Puppeteer.” What we are left with is a portrait of a man in battle, not so much with the material he is given to sing but the way in which it is given to him. Not everybody dealing with Jones had the patience to go round the bush. Reed, for instance, is very insistent that he would approach a Humperdinck song in a different manner from a Jones song, but too much of what is here veers towards the wrong side of schmaltz. Clive Westlake’s “Only Once,” for example, with its precious Spanish guitar, raspberry brass, regretful mutters about “the way young people always do” and general air of a failed Eurovision entry, is clearly a romantic/Hispanic song meant for Humperdinck, and so when Jones does it, it doesn’t work; similarly, the high camp of “Help Yourself” and “Love Me Tonight” are Engelbert environments in which Jones sounds utterly lost. But, as I say, perhaps Jones was lost from the beginning. This collection begins, as I believe all Jones compilations are legally obliged to begin, with “It’s Not Unusual,” a powerhouse performance which must have sounded like emissions from another planet in 1965. Rejected by Sandie Shaw as an A-side, Jones grasps the song’s contours with as many limbs as he can spare, and Reed astutely limits the orchestral backing to fortissimo trumpets, ruminative baritone sax and Joe Morello’s pained lead guitar. It went straight to number one – there was, after all, literally, no competition – but immediately set its own limitations. The British male solo star was a nearly extinct species in that age of Beatles and Stones – chart regulars like Roy Orbison, Gene Pitney and the transported Texan PJ Proby being Americans – and it is true to say that for the best part of two years Decca had no idea how to handle Jones, instead trying him in all directions. From this period comes his reading of “With These Hands,” an early try at his Big Ballad template ruined by an over-florid, cheesy, Liberacean piano and an over-fruity vocal delivery (it is possible that Jones had Bobby Hatfield’s performance on the Righteous Brothers’ “Ebb Tide” in mind). He fared better with film themes; John Barry pushes him to his physical limits on the Bond tune “Thunderball” – how better were the Bond songs when they were about the villain! – forcing a climactic high C following which Jones fainted in the studio. And “What’s New Pussycat?” is odd and misleading enough to keep Jones on his toes (even though he indignantly demanded an explanation of the lyric from Hal David). Only with “Green, Green Grass Of Home,” hitherto an obscure Jerry Lee Lewis album track, did Jones hit on his winning formula; tearful but unsentimental balladry sunk by battalions of ‘50s strings and choirs. Where on his original reading Lewis sounded unconcerned, resigned, about going to the gallows – and why is he to hang? What has he done with “sweet Mary”? – Jones never quite extinguishes the dread from his voice. Still, the single marked a bend in the road, where the adventure which had been straining at the leash throughout 1966’s groundbreaking series of 45s suddenly cut loose and sailed towards the more welcoming arms of the album format, leaving the charts more or less at the mercy of unambiguous, easily-felt balladeers. The format continued unabated throughout 1967; Mickey Newbury’s “Funny Familiar Forgotten Feelings” is treated as the slushy country ballad it isn’t. “I’ll Never Fall In Love Again” – co-authored by a resurgent Lonnie Donegan – comes closer to identifying Jones’ dilemma. Here he is, this honest soulman who listens to Otis, to Solomon Burke and Joe Tex, and in my opinion doing his best to give an authentic portrait of a destroyed, betrayed soul. Yet so much about the record conspires not to place it alongside “The Dark End Of The Street,” principally the same Radio 2 legion of gloopy voices and strings which dogs so many of Jones’ record; ultimately Jones is driven to faux sobs and growls just to stay afloat. This is a not uncommon problem; his reading of “Pledging My Love,” for instance, starts out as a fine and obviously heartfelt performance before the arrival of the schmaltz battalion (and needless final verse key change) force him into shouting and bellowing. Likewise, he does his manful best with the old Ray Charles chestnut “The Sun Died” but is immediately torpedoed by weeping wah-wah guitar and a confusing melange of brass, strings and voices; there is simply too much going on in the background. At the same time, Decca (and, it must be said, Gordon Mills) did their best to paint Jones as a “badder” boy than Humperdinck. “I’m Coming Home,” his ’67 Christmas offering, for example – why has he been away so long, and why does he think she’ll take him back, considering all he’s supposed to have done (has he been released from the penitentiary, or from the Army?)? He sings of unutterable emptiness (“My world is falling around me/I’ve got nowhere to hide”) but the song resolves nothing, emphasised by the early fade. In 1968’s “Delilah” – a song, significantly, written with PJ Proby originally in mind – Jones makes no bones about it; for the second time in his career, somebody in the song dies, and multiple layers of Three Amigos trumpet camp cannot hide the fact that it is a squalid, cheap song about sexual inadequacy and murder. Even Jones couldn’t follow that; hence the forced jollity of “Help Yourself” (Jones’ ad lib cackling suggests that “round the back for a bit of the old brandy” had indeed come to pass) although poor old Ken Woodman (mislabelled here as “Ken Wood”) tries his utmost to keep the package holiday portrait afloat. Beyond 1968 there is frankly not much to say (and so his reading of “Without Love,” one of his more convincing deep soul attempts of the period, is doubly missed). “To Make A Big Man Cry” is Reed trying to be Bacharach again, to little avail (“BeCAUSE it HAPpened to ME!” squeals Jones at one point). As for his forlorn early seventies, the less said, the better: in “Daughter Of Darkness” he is reduced to wishing the woman away, and although Martin Fry is anticipated more than once (“Sharing together the magic of love”) the whole sounds like a dodgy ITC detective show theme tune (Jones’ increasingly abstract ad libs appear to back this up). Paul Anka’s “She’s A Lady,” a Billboard number two, sees Jones doing his best to be Modern, and although Big Jim Sullivan’s guitar knows what time it is, the song, which essentially compares the singer’s wife with the lead trombone player in Anka’s band, patently doesn’t. Old school London Palladium belters like “Till” – a UK number two – kept the dowager demographic happy (complete with its closing “You Only Live Twice” rip) but one has to say an emphatic no to his interminable 1973 demolition of “Runnin’ Bear,” complete with “funky” rhythm and atrocious fadeout “chant” – “Indian Reservation” it is not (and is he, as Lena thought, really singing “happy hunting GOWN” at the end?). By 1974 Jones was down to the compulsory jauntiness of “Somethin’ ‘Bout You Baby,” which, with its “Billy Don’t Be A Hero” horn lines, is the cheapest-sounding track here, and certainly the smallest hit (it was lucky to reach #36). In sum, then, Jones’ Decca contract, like Humperdinck’s, was nearing its end, and as a straight Greatest Hits package issued exactly one year earlier had failed to penetrate even the top ten, the TV-advertised route must have seemed irresistible. I am sure that Abigails the country over must have bought this for their dinner parties, but even this is undervaluing the man; for a period (I’d say ’66-9) he was Britain’s Elvis, the deepest and shallowest repository of his audience’s desire and fears, and little wonder that they ran back to him when times began to look tough again. There he is, his shirt wide open, baring whatever is left of him to bare, or bear; and look at him at the back, bowing down with a rose in his teeth, and hope it doesn’t suffocate him. “Sick Again”? That’s putting it mildly. A funny thing about falling seriously ill; you are forced to take stock of everything and make a snap(py) decision about how much, or if, it matters, and more often than not you find it’s less important than you think. Since last I wrote here – indeed, as I was preparing to write about this very record – I’ve been a hospital inpatient, firstly at the Friends Stroke Unit at King’s College Hospital, then at the specialist stroke care unit at St Thomas’ Hospital, having suffered what specialists call a transient ischaemic attack, or as you and I might call it, a mild stroke. No joke at all was my condition throughout the first couple of days of admission when I was essentially unable to move, eat or speak; things could only improve from there, and they did, so dramatically that I was able to go home on Friday – a fine tribute to the plentiful and kind teams of physicians, nurses, therapists and other specialists who made my recovery possible. However, these same world-renowned teams have made it starkly clear to me that I had a lucky escape, am lucky to be anywhere at all, let alone in front of a computer; the stroke was precipitated by a long history of undiagnosed hypertension and what cardiologists term atrial fibrillation – abrupt bursts of arrhythmia in my heartbeat. My father survived eleven days into his fiftieth year before being struck down by coronary thrombosis, and as I am now just over two years ahead of hitting fifty, I have been told that the only way I’m going to make it even that far is to change pretty much everything about my life. Continuing to write about British number one albums is an early indicator of stepping in the wrong direction, but there you are. 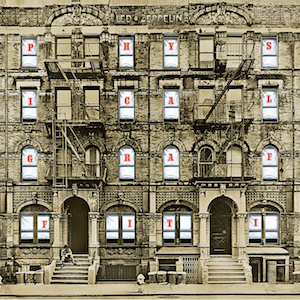 In any case I doubt I would have much of consequence to say about Physical Graffiti but I am more convinced than ever that it doesn’t matter nearly as much as it would like. There it stands, the imposing New York brownstone, containing seemingly all life, but on closer examination it’s the same combination of Google Images, band mugshots and Noddy Holder anyone might expect. The same goes for the music; had the CD existed in 1975, this would not have been a double. Zeppelin reconstituted at Headley Grange in 1974 to lay down some new tracks, ending up with eight, the material taking up around fifty-three minutes of time – too long for a single album, too short for a double. So the decision was made to bung the package up to speed with what is basically Led Zeppelin’s Odds ‘n’ Sods; hitherto unreleased and buried masters from 1970-72, including Houses Of The Holy’s previously unavailable (for it failed to make the original cut) title track. What these seven selections do is increase the record’s running time to just under eighty minutes – with delicious irony (or ironic delicacy?) a little too much for just one CD. But I don’t think that the extra material adds to the record’s imbalance so much as the fact that there are two records to take into mind here. Left alone, I’m sure that the first half, a compact thirty-five minutes, would have stood as one of the great Zeppelin albums, even though two of its six tracks are makeweight additions. On the same level, it’s impossible to flee the notion that the new material is very consciously conceived and executed to reinforce the idea of Zeppelin as World’s Number One Rock Band, and that the old stuff still finds them in a state of catch-up. Even routine rockers like “The Wanton Song” and the aforementioned “Sick Again” carry an expressionist determination absent from the daft “Black Country Woman” with its Don Partridge/McGuinness-Flint jugband mood and Percy Plant going beyond parody (his climactic “Whassa matta wit’choo mamma?” put me in mind of any number of questionable British comedians of the seventies attempting Burton Cummings, roast beef and all). Likewise, “Night Flight” trundles between channel-hopping genres to no great effect (R.E.M.’s “Bandwagon” sprung to mind) whereas the drone rock of “In The Light” is never less than clear about its intent, from the relationship between John Paul Jones’ sardonic harpsichord commentary and the band’s characteristic collapsing-into-itself angle of rock, to the unexpected materialisation of the leitmotif “Let me share your love” against backdrops prophetic of Aaliyah’s “We Need A Resolution.” The lazy sidestep shuffle of “Down By The Seaside” coasts by on its cocktail of “This Guy’s In Love” electric piano and Page’s iridescent Martin Denny marker pens without ever exceeding it (“Still do the Twist?,” asks an audibly exasperated Plant toward song’s end), but “Ten Years Gone” has enough passive reflection in its harmonic exquisiteness to make us realise where and how Jeff Buckley came into the picture. Next to that – “Boogie With Stu” finishes with a nice breakbeat. On the first album, both “The Rover” and “Houses” earn their place; “Custard Pie” is nothing more than stock, inviolable state-of-the-1975-art Zeppelin of the sort which justifiably made Jack Bruce exclaim “Pah! Why are you playing me session musicians?” with its let’s-fox-the-pub-tribute-bands chordal and rhythmic structure but its dynamics are sufficiently alluring that the increasing dominance of Bonham in the track (especially noticeable from the last verse onwards) is accepted as natural. Set against this, the angst of “The Rover” is appealing – Plant moving from mournful (“My love, she is lying on the dark side of the globe”) to cautiously confident (“IF WE COULD JUST/IF WE COULD JUST/IF WE COULD JUST/IF WE COULD JUST…JOIN HANDS! !”) while the song’s second half is nothing less than “For Tomorrow” by Blur. Even “Houses” gets by on its cowbell-powered “Gudbuy T’Jane” motor (though it’s clearly a B-side). Of the record’s three big setpieces, “In My Time Of Dying” is great fun, a three-cornered battle between Plant’s mortally wounded protagonist, Page’s guitar, hovering between Sumlin wail (the whole is really an elongated meditation on the Stones’ “Little Red Rooster”) and triple-bound rock rebound, and Bonham’s pitiless drums (the Page/Bonham synchronicity is particularly apparent here). Plant’s voice is content to moan in the background (“I never did no wrong” etc.) where Page’s guitar leaps out of the speakers like a jaguar when soloing, articulating Plant’s desired marching angels. On he goes, summoning whoever will come down to meet him – at times his “Oh my Jesus” sounds like “Oh my dealer” – and when Plant finally checks out, he finds himself unaccountably euphoric; “Oh, feels pretty GOOD!” He won’t unsink his teeth from the song, however, and the band finally have to resort to end-of-the-pier hi-jinks to get him out of there. That leaves “Trampled Under Foot” and “Kashmir,” both justifiably celebrated (and, I’d wager, the main, or only, reasons why people keep Graffiti), yet note how the cumulative impact of each track depends on accumulated power and momentum. Yes, “Trampled” is Tom Jones just having heard Innervisions - in Rock Classic terms it’s roughly halfway between “Superstition” and “Long Train Running” (“Talkin’ ‘bout love”) – and Plant bawls far too much through it (in fact my central difficulty with Graffiti boils down to a surfeit of Percy) but its trail is unstoppable; you don’t want the damn thing to stop, even when it accelerates towards the end, and it’s authentically funky in the same way as its direct descendent, Franz Ferdinand’s “Take Me Out.” Similarly, “Kashmir” makes for the post-’67 epic with its “I Am The Walrus” insouciance, Bonham’s fundamentalist (if carefully phased) drumming and Jones’ genuinely euphoric string and horn charts, marching between the twin key poles of D major and Gm7. And certainly the inner shudder – or is that disguised euphoria? – materialises the nearer the music strikes towards the Other, the exoticism and dreaminess powerful enough to make you forget that Kashmir is not in Morocco or Rawalpindi, but in the Himalayas; and while Plant’s impeccably imprecise “Let me take you there”s cannot be argued with, there is still the feeling of a big band flexing their muscle, letting us know that nobody in 1975 could compete with this (I mean…the Moody Blues? ELO?? Please! ), but not yet telling us what they can add to the tale. Still, there you have it, a two-step “Hey Jude” for a dispossessed generation; you know that the Cazale character in Dog Day Afternoon would have taken both steps deadly seriously. A couple of images from the music of late 1974 to early 1975. First, the love that has died, the bitterness in breaking up, the consequent directionlessness, words which go something like this: “It’s no good trying to make it better/You know it doesn’t feel right to do/Everything we shared together/Would break in two.” The spectre of the train, the coexistence of “somewhere” (or “a somewhere”) with “nowhere” and are the two really that different? Second, the music, reflecting, echoing the sound of the train the singer has been vainly trying to catch (before finally jumping on it at the end), streamlined, absolutist without being rigid, set out as neatly and meticulously as a grid, a music so seamless and faultless that it could have been breathed by the sweetest machine. One sometimes searches for evidence of the human hand, but of course it’s some of the most human music imaginable. I am not talking about Blood On The Tracks or Autobahn but the unlikely record which conjoins the two. Its obsession with trains may mean that On The Level is actually Quo’s Trans-Europe Express but it’s all there, just as nearly all of it is as evanescent and elusive as the Ames room on the cover (from “Down Down”: “I have all the ways you see/To keep you guessing/Stop your messing with me”). Think you have Quo nailed down? Think again. Everywhere on the record are mine traps designed to snare the unwary. “Little Lady” has Rick Parfitt being walked out on by his lady; there is this street, and she goes down and out of it, he goes up and down the same street with other ladies and eventually she comes back up, also now walked out on; all this is done against a standard fast Quo template but as the song reaches its turnaround point, everything dwindles down to a tiny pastoral Mike Oldfield interlude of twinkling guitars before a hard-pressed drone muscles its way back in. Rossi’s “Most Of The Time” starts out with the seeming intent of a quiet, quasi-acoustic rumination before the group quite unexpectedly thunders into the picture with a loud, slow blues workout topped by Rossi’s extremely anguished lead guitar. “I Saw The Light” – not the Todd Rundgren song – concerns itself with resigned disappointment but even the singer finally gives up halfway through; nonetheless he is paralysed (“Standing on a platform/Watching all the trains go past/Keep on trying to catch one/But you know they’re much too fast.” All around are the ashes of the past, the burning need to get away, to escape. “Down Down” becomes more remarkable – and radical – every time I listen to it. How did such an uncompromising single get to number one (indeed is the Quo’s only number one single to date, if you don’t count “Rockin’ All Over The World” topping the NME chart in autumn ’77)? They were on tour, probably at the peak of their popularity – but even those factors don’t fully explain this modernist phenomenon. Throughout the song Rossi plays hide and seek with the listener and the song’s subject – and who’s to say the two are different? Sometimes he is almost taunting (“You’ll be back to find your way/Again again again again again again again again”). The music, meanwhile, looks sternly forward to punk; there is that same clean division of lines found in the early work of the Ramones – separate channels for separate guitar lines, all notes clean and scrubbed, everything scientifically in its spontaneous place. Added to that are the tantalising hold ‘em poker drumless interludes which break down and rekindle our expectations of a further explosion in ways which directly anticipate, say, Daft Punk (“One More Time” in particular). It is one of the most inscrutable number ones, and one of the least resistible. “I told her of a life. I can’t quite put my finger on why this album proves so unexpectedly moving, other than it (again) disproves the idea of Quo as three-chord ponies; it seems to me a very compassionate record; virtually none of the songs could be described as “happy” and yet hope is never banished from their grooves. Apart from Parfitt’s occasional keyboard overdubs, there is nothing and nobody else on the record but the core quartet, mostly playing live in the studio, and it remains a potent steamboat of resistance against whatever else sought to suppress spirits at the time (and now). Where Humperdinck’s world (as represented in the previous entry) is finally a rather claustrophobic one, the Quo manage to charm and caress their way through the barriers, and thereby reach another level.